With this installment of Yearning to Weave, we’re evolving our column to include spinning tips and hints. Much like Yearning to Weave, Yearning to Spin is designed to assist new spinners to develop their spinning technique. Stephanie Flynn Sokolov is an enthusiastic and creative spinner. We’re happy to have her contributing to our monthly Yearning to… columns. She’ll alternate months with Melissa, who’ll be returning next month from maternity leave. If one of your personal goals is to get skinny, why not start with your yarn? One of the easiest ways to spin fine is to spin over the fold. With some faith, trust and twisting dust, you’ll amaze yourself with how skinny you can go! Spinning over the fold is a technique for spinning a staple length of fiber in an indivdual bunch folded over your finger. Fibers three inches or longer tend to work best. This is a simple and friendly way to control fibers that may be a little unruly otherwise. From the fold you can use a long or a short draw to tame fly aways or slick fibers. If you’re fairly new to spinning, your first yarn was probably fat and lumpy. Most likely over time your yarn has become finer, though you may not yet have consistent results for achieving the yarn you want. By gaining command of your tools and use of materials, you’ll soon be able to spin the yarn you want when you want it. The best way to achieve this is to learn how to adjust your spinning wheel so that it does a lot of the work for you—I’ll talk about this a little later. What fiber and why? Spinning over the fold is a great technique to use for long, slippery fibers with tendencies to misbehave, like silk, soysilk, flax, or hemp. Try spining over the fold on longer animal fibers where you have first opened the fibers by flicking the ends. This technique works best when the fibers slip easily past each other while drafting and would otherwise tend to float away or blow apart from the crucial area where the twist enters the yarn known as the drafting zone. If you are lucky enough to have a super huge fiber stash, grab some silk top and raw alpaca. Silk top is available in most shops carrying spinning fiber. If your local shop doesn’t carry it, retailers online offer a plethora of beautifully hand-dyed selections. Many people today raise alpacas so it is fairly accessible to most spinners. If you don’t know someone who raises alpaca, ask around. I think you’ll be surprised. The skinnier the yarn, the more twist it needs to stay together. Every spinner has his or her own style, and as spinners we all have a default yarn—the yarn we spin without thinking. Generally, spinners have a natural treadling speed. Mine is slow, and knowing this helps me adjust my wheel to spin the yarn I am aiming for. My treadling is constant, slow. If I try to treadle faster to add more twist, I set myself up for disappointment. If you want more twist in a yarn, you need to increase the speed of your flyer and decrease the tension on your draw-in. To do this, decrease the diameter (smaller) of the whorl and decrease the tension of draw in. Using the smaller whorl will cause the flyer to spin faster adding more twist to the yarn. Decreasing the draw-in tension will give the twist more time to build up in the yarn before it draws on. If you spin in double drive loosen the drive band. If you use Scotch tension release the tension on the Scotch tension band. If your default yarn is already fine, then you might not need to make adjustments to your wheel to spin over the fold. But, if you are looking to slim down, you will want to make adjustments to your wheel before you tackle spinning this new yarn. I suggest starting with the silk since it has already been prepared for you. I find that the ends of the top are sometimes a little ratty. I pull out a staple length of this tangled part and discard it. Now you should have a nice wispy end. Pull out a staple length from this more-organized end and lay it on your thigh. Line up 3-5 staple lengths, so as you finish one group, you can easily pick up the next. Place the staple length of fiber over the index finger of the hand you usually hold you fiber with. Now, take the leader that is attached to your bobbin coming out your orifice. Place it next to your bundle of staple length fibers closest to the tip of your finger. Hold the leader with your thumb and as you start to treadle, the folded fibers will magically start to spin around your leader. Take your forward hand that you use to control the twist and gently pull the fibers away from your index finger toward the orifice. Smooth your forward hand over the yarn back toward your index finger and repeat this process giving your yarn to the wheel and letting it draw onto the bobbin. This will give you a semi-worsted yarn. If you are not able to spin in a relaxed fashion, the yarn is being sucked into the orifice too quickly. Release some of your take-up tension to slow down the draw-in on the bobbin. The finer the yarn the more twist needed, but if your yarn is “pig tailing” before it draws in you will need to increase your draw-in tension. Make small adjustments to your Scotch tension adjustor, or drive band tension knob if in double drive. If after you just your tension, your yarn is still “pig tailing”, then you should try moving your drive band to a slower (bigger) groove on your whorl. This will slow the flyer down and give you more time to familiarize yourself with a new technique and allow you to treadle at your default speed. Using these two adjustments will allow you to control the diameter of the yarn and slim it down. When you have spun your first bundle of fibers stop treadling and pick up the next bunch of fibers, fold them over your index finger, and place the end of the yarn you have just spun from your first bundle next to the edge of folded fibers on your index finger and start to treadle, letting the folded fibers twist around the yarn from your first bundle. I love using this technique for alpaca because the raw fleece locks tend to naturally separate into bundles. 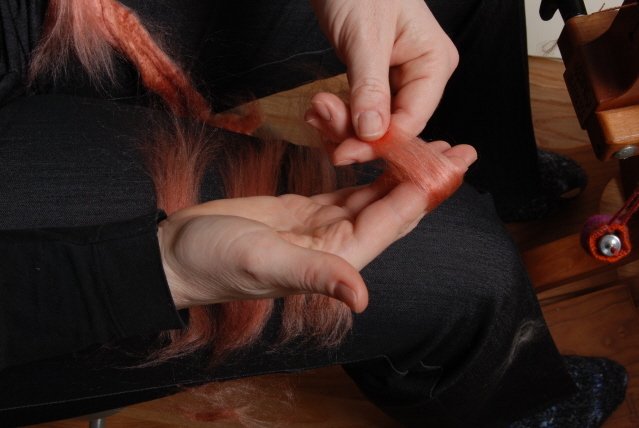 Since there is no lanolin sticking the fibers together, the fibers easily slip past each other when folded over your finger. Even though alpacas like to roll around in the dust, most of the fiber I have encountered here in Colorado tends to be very clean. I therefore spin it raw and wash the yarn when I’m finished spinning. If you find that the ends of the fibers are sunburned, comb the tips off with a metal cat/dog comb while arranging your bundles on your thigh. Getting skinny with your yarn is easier than you think. Using simple adjustments, your spinning wheel is just the tool to take you there.